¡Yay! ¡Slots! Probably the most boring thing on earth unless you are a compulsive gambler. The catch is, basicly, that you put a coin, and then hit a button, and then maybe you win, or maybe you lose. Great time-killer, innit? 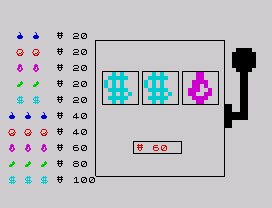 Salvacam has submitted a great rendition of the arcade slot machines – at least a great rendition of the most simplistic ones, as you only have to press M to insert a coin, and then wait. Then hit M. Again and again until you are fed up with it or you run out of money. The graphics are big, the animation is good, I love the fact that the game is using the same currency as in Alex Kidd in Miracle World, and the fact that this may be the most boring experience I’ve had in years makes it a great contender for the prize! Stay tuned, Salvacam, maybe the packet of rollos is for you this year! Who knows?